An Eau Claire native, Ralph Evans began his broadcast career as a part-time student transmitter operator at the University of Wisconsin’s WHA radio in 1940. As a professional engineer he was the guiding technical force behind the development of Bartell Broadcasters, a Milwaukee-based radio broadcasting company that grew into a national broadcasting and publishing media corporation. 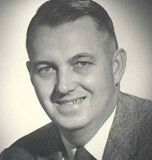 During his time with Bartell he built six radio stations and two TV stations throughout the country, including WEXT-AM (now WOKY) and WOKY-TV (now WVTV), Milwaukee, WTWT-AM (now WSPO), Stevens Point, the now dark WOKW-AM, Sturgeon Bay and WMTV-TV, Madison. He rose to the position of Vice President for Engineering for Bartell Media Corporation in the early 1960’s. Always to the cutting edge, he was one of the early designers of cable television systems in 1966 with projects in Plattsburgh, New York and Waterville, Maine and he also constructed the two-way interactive learning system connecting all of the school districts in Trempealeau County, Wisconsin, which is one of the models for distance learning in secondary schools throughout the state. When Bartell Media Corporation divested its broadcast properties in 1967, Evans formed a communications consulting firm, Evans and Associates which continues to serve clients throughout the country. Ralph Evans passed away on September 25, 2005.